The Dance of Life with Jenna: Only Five Possessions? If I could only choose five, what five possessions would I want to keep? I would keep the old Family Bible that my grandma, Lois Geraldine Squires Vick, left me in her will. It was handed down to her by her parents. It is an antique Bible, dated 1883, with lots black and white illustrations. In the front Grandma wrote, “Family Bible which belonged to Earl & Minerva Squires. This Bible should be given to Jennifer (Vick) Silliman. The Bible belonged to her great grandparents. My Grandma prayed for me every day of my life and probably still prays for me in heaven. She left the Bible to me because she knew I love the Word and I love God. My Amplified Bible is another item on my list. I read two pages or more every morning and ask God to speak to me. He always does! It is full of notes, dates next to verses, and underlining. I love my old New American Standard Bible too. It is my first one that I bought after I decided to follow Jesus, on March 23, 1974. However, I can only choose five items, so it has to be left behind. The other photo album is of my childhood that I titled, “The Vickids’ Childhood Photo Album”. It is a photo history of the Vick family—or at least my branch as far as it reaches. This album also contains my side of the family’s stories and also genealogy, from both my father’s and mother’s sides of the family. At age five my real mother left us, so it was quite a bit of work gathering everything from the Pearson family. I have very old photographs in there and chose the best to represent each of us to express who we are and who we were growing up. After my brother, Joshua James Allan Vick, died of heart failure, September 24, 2007, my sisters and parents and myself, sent any and all photographs of him to each other. We had to see every one! I gathered them all together and lovingly dedicated the album in memory of him. I gave the album to my father, James Allan Vick, for Father’s Day in 2008. I also gave the album to my sisters, Reine Vick Bullard, who lives in Michigan, and Judy Vick, who lives near San Luis Obispo, California. Last, but not least, I would keep my computer. It has my writings on it and lots of photos of my children and events from my life. Writing this has made me realize that I have to get to work on a photo history album of my children. I do not want to trust my computer to keep photographs safe! I have boxes and boxes of pictures, so this project is daunting! Also I would like to gather my stories and writings into an album, so they are all together and can be read and enjoyed for generations. 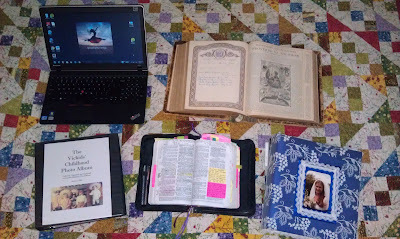 Someday I will re-do this writing and title it, “Seven Possessions--Bibles and Albums”.